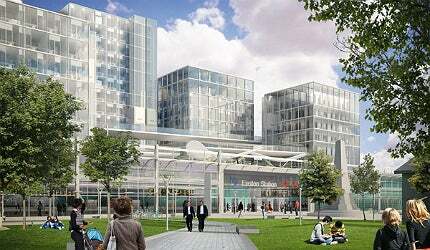 A new interchange station will be built at Old Oak Common in north-west London as a part of the HS2 line. A graphical image representing the entrance of the HS2 London Euston station of the HS2 line. Aerial view of the Delta junction of the HS2 line project. Artist's impression of a high-speed train HS2 link crossing the Birmingham and Fazeley canal viaduct. A graphical image of Birmingham Curzon Street station interior. HS2 is a new high speed railway line under development, which will run between London and Birmingham, Manchester and Leeds. The route is also referred to as the Y network since it is roughly in the shape of the letter Y. It is one of the most substantial transport infrastructure projects ever built in the UK. The project will provide vital transportation links between cities and regions across the United Kingdom. The HS2 network will reduce journey times between some of the UK’s largest cities and also create economic benefits and thousands of jobs. The construction of phase I of the HS2 line is scheduled to commence in 2017 to be ready for the opening to passengers in 2026. The UK currently operates a 108km high speed railway line known as High Speed 1 (HS1). "HS2 will extend from London (Euston train station) to central Birmingham (Curzon Street station), and then divide into two branches." A company named HS2 was set up in January 2009 by the Department for Transport (DfT) for the development of the HS2 project. The company submitted the proposals to the government in the first quarter of 2010 and the preferred route option was announced in October 2010. The public consultation on the proposals was completed by July 2011. The government approved the recommended route in January 2012. HS2 is set to begin the engineering, design and environmental work for the first phase of the project. A hybrid bill is expected to be lodged in the Parliament by the end of 2013 to provide the authority to construct phase I of the project. Recommendations on the routes for phase II will be submitted to the government in spring 2012. Further consultations on the affects which will be had on property along the London to West Midlands line will be held in 2012. Consultations on the Environmental Statement will take place in 2013. The proposed London to Birmingham line will be about 140 miles (225km) long and the total Y network will be around 330 miles (531km) long. More than 50% of the 140 mile route will pass through cuttings or tunnels, while around 56.5 miles (91km) will be partly or completely concealed to reduce noise and visual effects in neighbouring communities. The first phase of HS2 will cost around £16.3bn ($25.8bn) to construct. The full Y-shaped network, including connections with the Channel Tunnel and Heathrow, will cost £32.7bn ($51.9bn). HS2 will extend from London (Euston train station) to central Birmingham (Curzon Street station), and then divide into two branches, running towards Manchester and Leeds, with connections to the existing East and West Coast main lines. "A company named HS2 was set up in January 2009 by the Department for Transport (DfT) for the development of the HS2 project." The route between London and Birmingham will continue through a 4.5 mile (7.2km) long tunnel after Euston. From there, it will continue through new interchange stations at Old Oak Common in north-west London and Birmingham, where it passes the National Exhibition Centre (NEC) and Birmingham Airport. Passengers can access Crossrail, Heathrow Express and Great Western Main Line services at Old Oak Common interchange. The route segments between London and West Midlands will include tunnels at Ruislip and the Chilterns Area of Outstanding Natural Beauty (AONB). Sections near Turweston, Chipping Warden, Southam and Burton Green will consist of cutting and tunnel segments. The HS2 will be operated with high-speed only trains and classic compatible trains offering higher seating capacities, to serve the large volumes of passengers arriving at the same time. The Airdrie-Bathgate Railway Link connects Edinburgh to Glasgow through Bathgate, Drumgelloch and Airdrie. High-speed only trains operate only on high-speed tracks, while classic compatible trains run on high-speed and existing tracks. High-speed trains will run at a speed of 225 miles an hour (mph). Each unit will have a length of 200m and the capacity to carry 1,100 passengers. Two vehicles can be joined together for operating during peak times. High-speed trains will require different types of stations, offering a platform height of 760mm. CH2M Hill was appointed as a development partner to provide engineering, design and environmental assistance for the HS2 project, in January 2012. The Birmingham New Street Station is an important hub and gateway to towns and cities across the UK. In March 2012, HS2 contracted the ERM Temple Group Mott MacDonald Consortium, Atkins and Arup to undertake environmental impact assessments (EIAs) for the project. In April 2012, HS2 placed contracts with Mott Macdonald, Atkins, Capita Symonds Ineco JV and Arup for designing various segments along the high speed line. In May 2012, Parsons Brinckerhoff was awarded contracts to design high speed rail systems for the first phase of the project and to deliver design changes on the present Network Rail systems at major interface points, to allow the construction of HS2. Tilting trains can reduce journey times on conventional track, as opposed to purpose-built high-speed lines such as French LGV or German Neubaustrecke. As the global population hits seven billion, densely populated countries face a complex logistical challenge of catering for the public transport needs of their increasingly mobile citizens.